Rumors in France claim that Karim Benzema will not be transferring anywhere in the current transfer window, and he is expected to stay in Real Madrid. Chelsea made a bid of £50 million for Wayne Rooney following Monday’s match between the teams. Could this be the final chapter in the Wayne Rooney saga? Will Cabaye’s strike make Newcastle accept PSG’s €17 million bid? The Marke claims that Arsenal made it clear to Real Madrid that they are willing to pay over €30 million for Ángel di María. The Blancos are expected to agree to the bid, even though the player himself is not interested in leaving. Another player who is on many clubs wanted list is Samuel Eto’o. The players agent said: “I spoke to Mourinho, and he offered us a 1 year contract. Samuel is interested in playing in major leagues, and believed in Anzhi, but then the owner said it is all over”. The daily Telegraph claims, however, that the player already signed with Chelsea for £2 million. As Europe awaits an official announcement about Gareth Bale’s transfer to Real Madrid, Tottenham is preparing for the day after. Sky network reports that the club is close to signing Romanian defender Vlad Chiriche?. 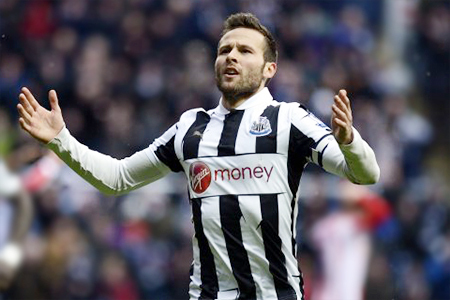 The British Metro claims that PSG will try to beat Arsenal in the race for Yohan Cabaye with a £17 million bid. Reports in Italy claim that Napoli made a €9 million bid to Valencia for Adil Rami, but were rejected by the Bats. The Sun claims that Arsène Wenger is willing to offer Newcastle £10 million for their goal keeper Tim Krul. Willian transfers from Anzhi Makhachkala to Chelsea for £32 million after long negotiations. Reports in England claim that this would put Gareth Bale’s transfer to Real Madrid in danger. Striker Luke Moore signed a 3 year contract with Turkish Sanica Boru Elaz? ?spor after being released from Swansea. Benfica signed midfielder Ljubomir Fejsa from Olimpiacos on a 5 year contract for €5 million, and added a €35 million release clause to his contract. Is Microsoft Shutting Games for Windows Live Service?